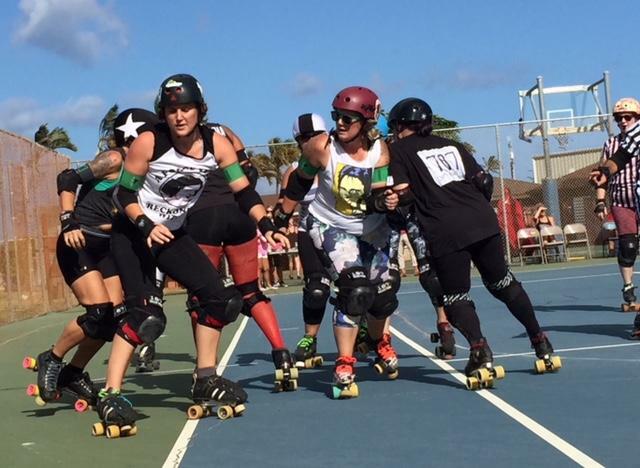 Pacific Roller Derby is the name of Oahu's only roller derby team. 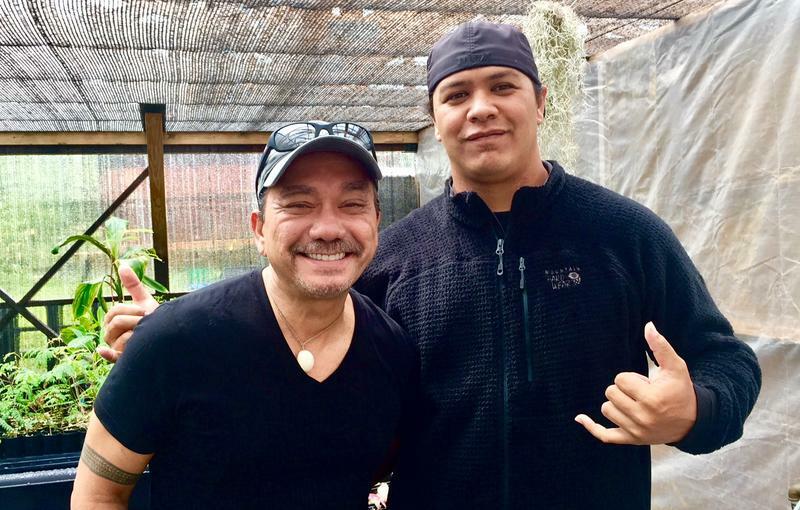 Currently there is one team on Maui, one on Kauai, and there are three on Hawaii Island, where the Big Island Brawl was held May 31-June 3, 2018. Derby girls all use quad skates, and wear helmets, elbow pads, knee pads, wrist guards, and mouth guards at all times. 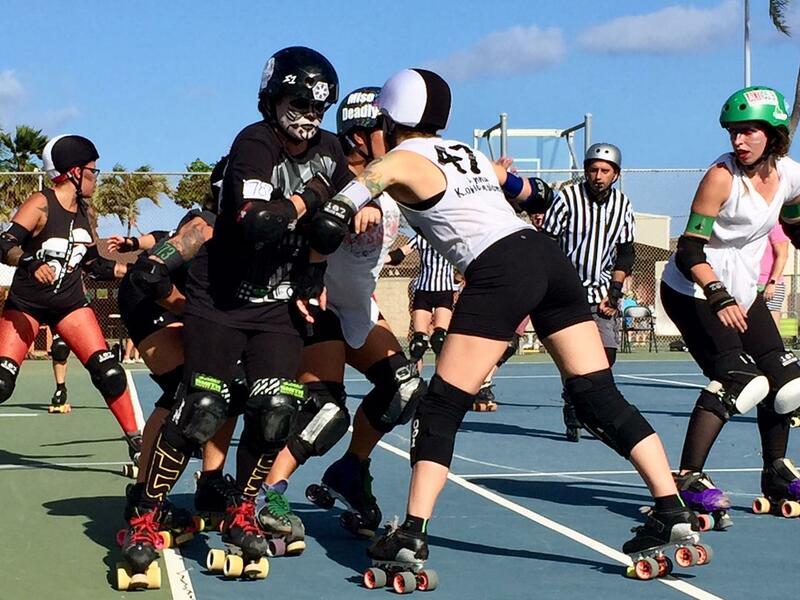 Find out about Pacific Roller Derby on Oahu. Normally you’d need a Department of Defense ID to access the aptly named Hideaway Club here at Kalaeloa airport. 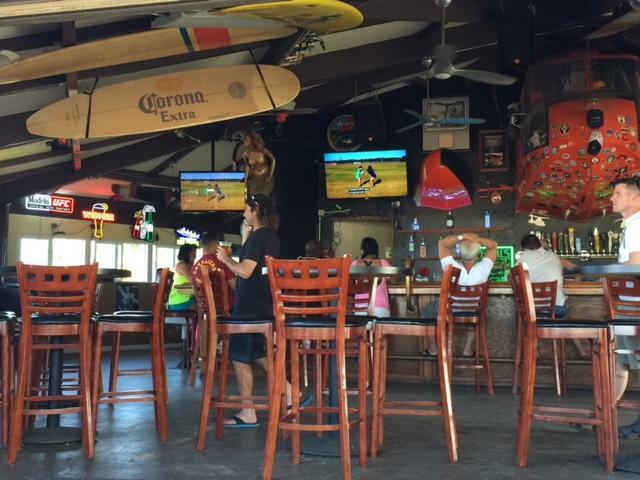 The old style, kind of nautical bar area opens up to a basketball court, breezy and baking in the sun. A tented area is filling up alongside the court, where the women of Pacific Roller Derby are just starting to warm up. 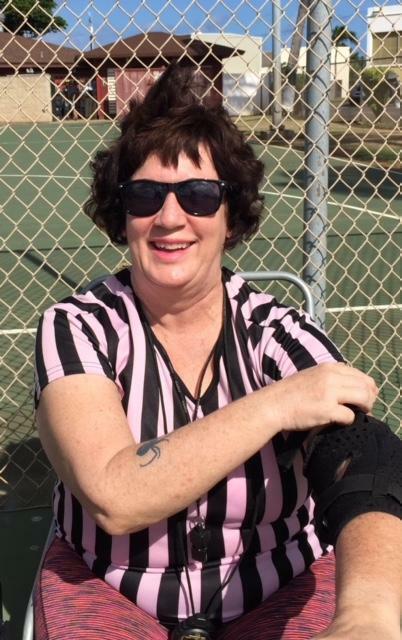 Teresa Shimizu, aka Windward Widow, is a roller derby referee. She played one season with Pacific Roller Derby, and now appreciates being in the game, without getting knocked down. How it works: A team makes points by having its lone jammer circuit the ring—blockers both hinder and make way. Shimizu: They take some mean hits. But they do break the rules so that’s why we’re out there. Teressa Shimizu is a referee, as you can see. generally, the idea is that there are two teams, each with 4 blockers and 1 jammer. The jammer is the one with the star on her helmet. points are scored each time a jammer makes a full circuit of the ring. Dusty Berard, aka Dirty Dixie, says it took a year to learn to skate safely, then, her eyes were opened at RollerCon in Las Vegas. Dixie: It’s international. It’sempowering women and children around the world now. Dixie says her husband originally told her about Pacific Roller Derby—she had done contact sports before, and was a cross-fit enthusiast. Dixie: That, and I think it’s just because I’m a larger person. I’m 5’10”, 250 pounds, nobody wants to get hit by that right? Now Dixie calls her husband the “Derby Widow.” Nicknames proliferate here, just as participation expands into the family. Maniac Monkey’s husband, for example, who is a referee, is nicknamed Darth Zebra. On this particular Saturday, there’s a crowd of maybe 50 supporters enjoying the camaraderie. July is dark, but games are planned here at the Hideaway August 25, September 29, and November 3, 2018. Games start at 4, pay $10 at the door, and non-military need to sign up to be put on the guest list to enter. Email for your tickets here. It’s pretty sunny, but tradewinds are up, and the gals have wisely secured a beer sponsor, making the refreshments quite affordable. Fans just bring a chair and chill. If you get inspired, the gals will set you up. The 4 blockers on each time try to hamper the opposing jammer and make way for their own. the first jammer to make a circuit becomes the Lead, and can call off the round, or jam anytime--usually before the opposition has a chance to score. Ailsa Horkey, aka Heidi Doom, is in charge of new recruits. She says you can borrow everything—except the mouth guards. 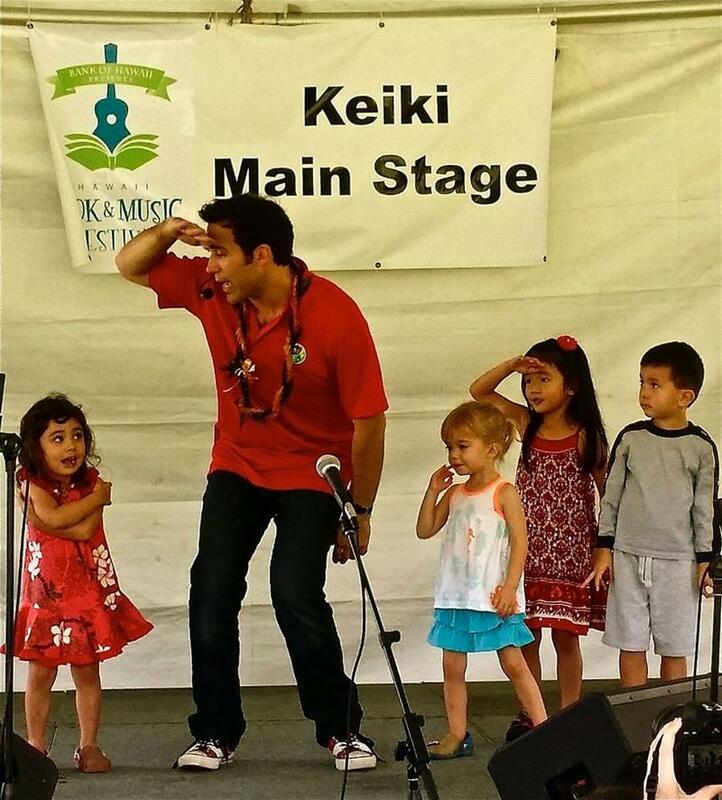 They practice weekly in Papakolea and Mililani. 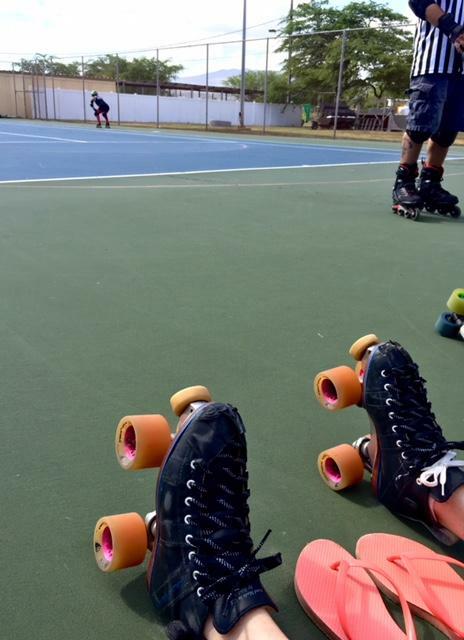 Some remember the heyday of roller derby in Honolulu, gals all elbows tearing around the banked track at Civic Auditorium in the 1960’s. This is quite different, actually. 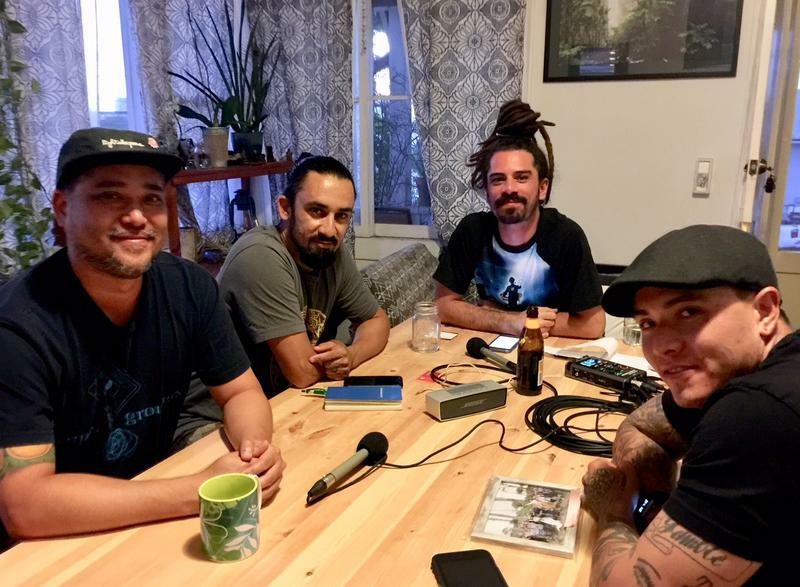 Pacific Roller Derby, a couple dozen members strong, formed in 2008, and is a member of the Women’s Flat Track Derby Association that promotes the sport around the world. The U.S. Coast Guard Hideaway Club at Barbers Point. Shimizu: You come, and you think, this looks fun! And you try it and you just get hooked. Darth Maul and some storm troopers were there, by the way. There’s no disputing, a good time was had by all.